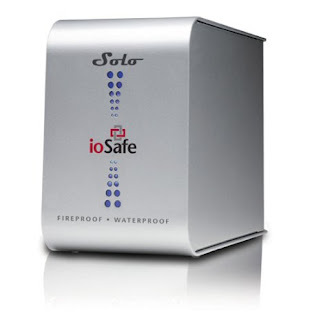 John Flucke's Blog - Ramblings of Dentistry's Technology Evangelist: Testing of ioSafe Solo to Begin Soon! For you regular readers of the blog, you may remember back in January 2009 I posted about a device called the Iosafe Solo that was a portable hard drive enclosure. However, this thing isn't your normal portable hard drive. The Solo is designed to survive almost any catastrophe you can throw at it. It is fire resistant and water resistant. Now, I'm happy to say that I'll be able to give the product a full testing in my office. I'm really looking forward to this as I love the idea of a backup that is almost indestructible. I'll be posting here and also Twittering about my experiences as I work with the product. Stay tuned for updates on this device which could well change the aspect of backing up in a healthcare setting.